VIP offerings for the 17th annual Electric Daisy Carnival, Las Vegas, featuring high-end amenities for VIP guests, have been announced by Insomniac. Because general admission and VIP tickets are now sold out, purchasing a VIP table experience from Marquee Nightclub offers the last chance for fans to gain access to the electronic music festival at the Las Vegas Motor Speedway, June 21-23, 2013. 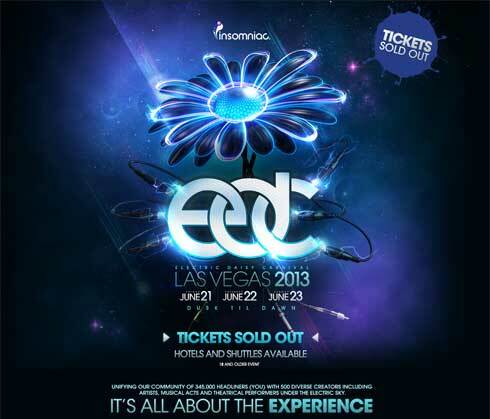 Insomniac released a diverse list of creators who will each play a part for the 17th annual 2013 Electric Daisy Carnival Las Vegas at the Las Vegas Motor Speedway from June 21-23, 2013. This list includes musical acts, artists and theatrical performers, all of whom are innovators in their respective fields. Insomniac, America’s premier electronic dance music festival producer, is announcing that they are partnering with England’s legendary electronic music event producers, Cream, to create the first-ever United Kingdom edition of the world-famous Electric Daisy Carnival (“EDC”) at Queen Elizabeth Olympic Park on Saturday, July 20, 2013. 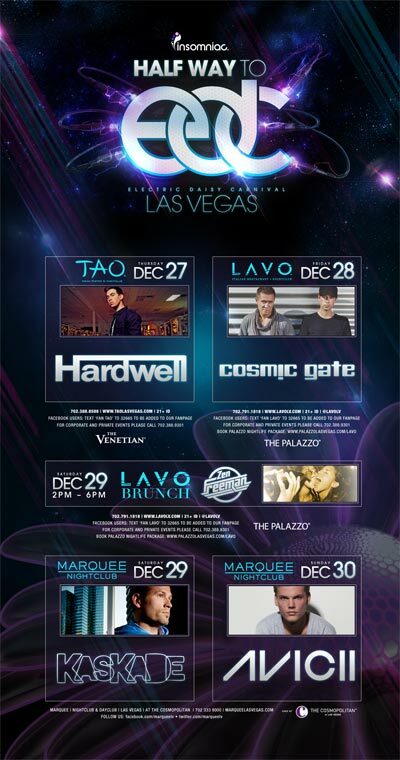 Insomniac, the producers of the Electric Daisy Carnival, and TAO Group present four days of world-class DJ programming at LAVO at The Palazzo, Marquee at The Cosmopolitan of Las Vegas and TAO at The Venetian from December 27-30, 2012.